When dieters think about foods to avoid, mashed potatoes are usually at the top of the list. But who wants to give up the creamy, buttery taste of whipped potatoes—especially at Thanksgiving or at other festive holiday meals? It's true that potatoes have a bad reputation among dieters. But it is possible to eat healthy mashed potatoes and still stick to your diet for weight loss. Are mashed potatoes healthy? Potatoes are not necessarily bad for you if you are trying to lose weight. Potatoes are naturally low in fat and high in both potassium and vitamin C. Of course, potatoes are starchy, so people who are following a low-carb diet may want to avoid them. But if you are counting calories, potatoes aren't a bad choice. There are only about 100 calories in a potato. But the size of your potato can vary, so if you're not careful, the calorie count can skyrocket. A medium potato is about the size of your fist. The baked potato you get at a steakhouse can be 2-3 times that size. If you want to keep potatoes on your plate when you're losing weight, you can do so. And mashed potatoes are okay, too, as long as you're careful about portion size and preparation methods. 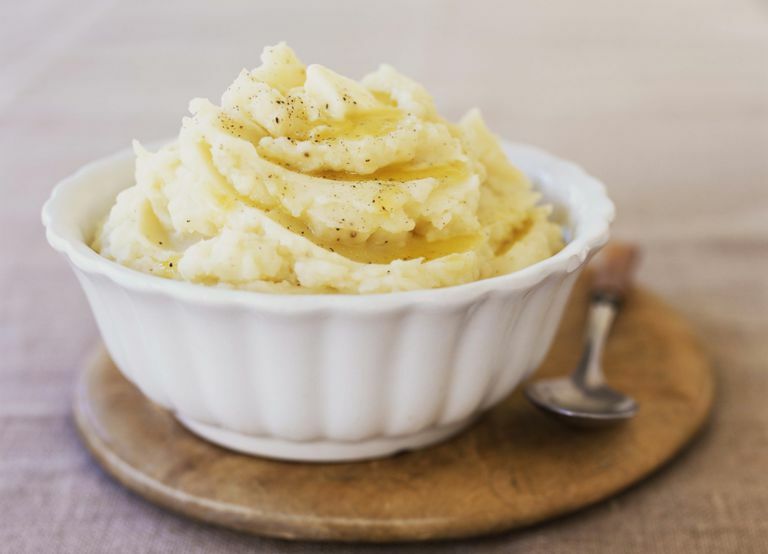 Even though plain potatoes are low in calories, mashed potatoes aren't always healthy. A traditional homemade serving of mashed potatoes can contain 237 calories or more when they are prepared with butter and whole milk. Some chefs even prepare mashed potatoes with heavy cream, which drives the fat and calorie count higher. And if you top your potatoes with gravy, then your total intake could exceed 400 calories. If you're eating in a restaurant, assume that the mashed potatoes are made with high fat and high calories ingredients, unless stated otherwise on the menu. Higher fat ingredients make potatoes taste better. Instead, order a plain baked potato and mash it with salt and pepper (use your fork) to keep the calorie count in control. But if you're eating at home, try making a healthier version of whipped potatoes with less fat. There are a few different swaps and tricks you can use to cut calories and make your mashed potatoes more healthy. Add creative seasonings like garlic, paprika or ranch style salad dressing to give your mashed potatoes more zest. You can make creamy, buttery, delicious mashed potatoes that will satisfy your cravings and keep your family healthy. Don't be afraid to stray from the traditional family recipe. Use one of these recipes for a low-calorie mashed potato, garlic potato, and mashed cauliflower for fresh, new healthy taste. Lastly, remember that portion control is essential. A single serving of mashed potatoes is just one cup. It's easy to serve more than that when you heap them onto your plate. Take one small serving and try not to go back for seconds. Save your calories for the pumpkin pie and your waistline will thank you. Can You Wash the Starch Away in Potatoes?